Memories & mementos that last a lifetime remain as the dust settles on the hype that was associated with the filming of Star Wars Episode 8. Last weekend the combination of the fantastic weather experienced on the Peninsula contributed to the latest attraction; film location for Stars Wars at Malin Head. It was no doubt popular with avid explorers venturing around the trails in search of the exact points where filming took place. Banbas mobile coffee unit that provided refreshments for the cast and crew while onset was also a hive of activity providing refreshments alongside the Wild Atlantic Gifts stand during the last week. Many visitors that frequent Farrens Bar, Malin Head can view the mural and signed stormtroppers boot by Mark Hamill. Enjoying a pint at both Farrens and food at the Seaview Tavern was just the best experience according to one group of visitors from Italy and the UK. One visitor stated “today will remain in my book as a one off experience to add to their lifetime memories, great weather, scenery, good food and drink along with a good stretch of the legs around a location chosen in relation to the sequel to Stars Wars”. 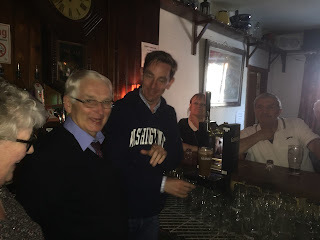 More good news followed with the WAW Bus Tour visit on Monday 30th of May to Buncrana from Rte’s Ryan Tubridy hosting his show from the market square between 9am-10am. He came out to meet and greet the locals and our very own Nan from Inishowen Tourism joined in the celebrations on the street. Members of local businesses came on to talk about the attractions and special hidden gems along this section of the Wild Atlantic Way. Ryan was invited to experience some of the highlights of our special Peninsula visiting various areas and taking time out on the water to indulge in his favourite pastime, fishing. Sailing away from Bunagee Pier with Inishowen Boating Company with John Henry at the helm he took in the sights around Malin and was lucky enough to get a close up encounter with a shark enroute. Disembarking with a great catch he dropped in to pull a pint at McGuinness’s Bar. It was thirsty work fishing in the glorious sun all day. Inishowen tourism were pleased to be advised that further to the success of the Northern Lights event organised by Inishowen tourism last November held at the An Grianan Hotel Burt, a small team of international media are visiting the Peninsula on a three day accompanied tour to help create awareness of all Inishowen has to offer in terms of a visitor experience. A comprehensive itinerary has been put together for them by Failte Ireland and Inishowen Tourism has arranged a welcome pack on their arrival. A photo/feedback session to gain insight into their overall impressions of the tour will take place during their last evening here before travelling back to Dublin flying back to their respective countries of origin. As the Development Officer here it highlights a positive initiative for all concerned; it presents an opportunity to collaborate with Failte Ireland publicity team to ensure all parties involved in the promotion of the tourism product here in Inishowen showcase the Peninsula and maximise awareness of the truly beautiful unspoilt area in County Donegal.